I’m getting ahead of the game for my April 2017 goals. Ok. So, it’s just one day early, but considering March’s goals weren’t up until almost mid-month, I’m calling this a win! Plus, there was an educational evaluation for the twins, new therapy appointments, and a teacher’s conference. This last part of the month, I’ve been working on getting ready for a rummage sale, and fundraising for the March for Babies. Phew. I’m tired just writing that out. So, let’s see how I did on my goals with all this extra activity. Go to the gym at least 3 times a week Yes! Even with a pulled neck muscle, I still managed at least three times a week. Increase my water intake No. Still need to work on this. Schedule a follow-up with my doctor – I’ve been having lots of issues with my acid reflux Yes! I have a scope scheduled for Monday. Get used to my new glasses – I tried the no-line bifocals, and it was a fail. I pick up my new single lenses tomorrow. I have the glasses. I’ve tried them on. Not gotten used to them quite yet. Have a date night, and try out a new babysitter Yes! 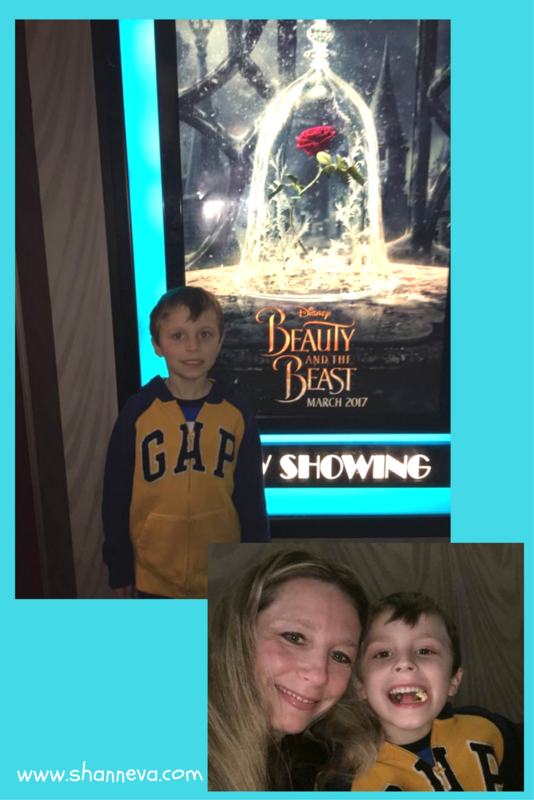 Even though it was a date night that included Mr. B, we still got out and LOVED the new Beauty and the Beast! Add more people to our March for Babies team and raise more money for the March of Dimes. We have a few people signed up, but we are way behind last year. Figure out school stuff for next year with the twins (blog post will be coming soon) We are in a holding pattern on this. Waiting to see about the financial portion. Get our family calendar organized Yes! Start to de-clutter everyone’s room The bathroom was started, along with all the boy rooms. Have 1 post written ahead of time each week Nope. Not even close. Find more things for Try It Tuesday (If you have an idea, please comment below or email me at shanneva@yahoo.com) I have one planned, but I need more ideas! Answer all my emails in a more timely manner Not really. Try to get to the gym 4 times a week. Find new ways to de-stress. Get in a new routine with our new activities. We’ve added 2 days of therapy for the twins, and all three boys will be starting T-ball/Baseball. Plan the twins’ 5th Birthday. Yikes. Get back to writing at least 2 posts a week. Try for 3. Write out an outline of content for the month. Get those email sorted and answered once and for all. Get my blog security figured out. That’s it! It may look simple, but it’s a lot for me when you add it into the daily activities of life. The de-stress one is really important, and I NEED to do it ASAP. 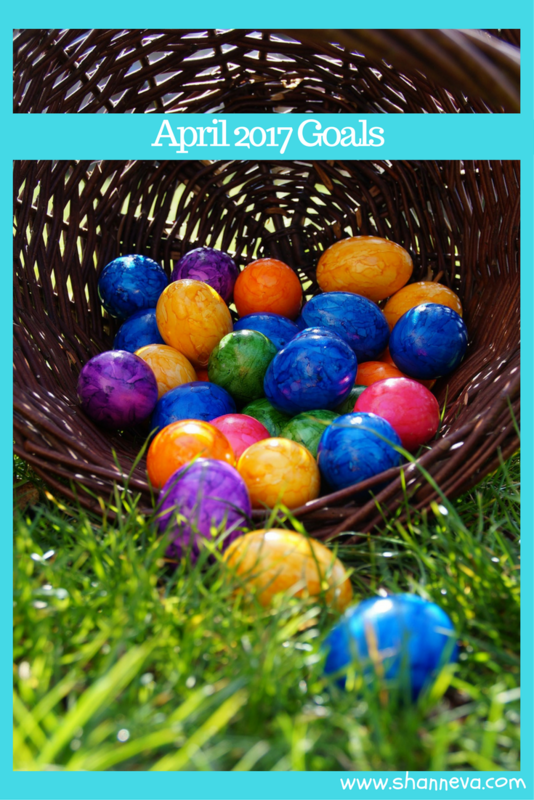 Have you set your April 2017 goals yet? What’s on your list this month? Kudos to you on the goals you did complete! I think any accomplishment is a good one! I’m with you on the working out and drinking more water – every week I set out to up my intake of water and then I’ll be half way through a work day and realize I have hardly had any! It’s tough! Happy weekend and Happy April! I want you to link this up to my gratitude and goals linky! My blog goals to have posts written in advance are fail too hah. So glad you got to see (and loved!!) Beauty and the Beast! It was so good. For Try it Tuesday… have you tried Jamberry nails yet? I just started selling them but I’ve been wearing them for 3 years and I love them. Let me know if you’d want to talk about that 🙂 I got some samples and stuff that I could send out. Nice goals! I have horrible acid reflux and have a scope scheduled next Friday! I hope they find you some relief and I hope I get some answers as well! Good luck with your goals! Good job on your March goals. I loved Beauty and the Beast – so that’s awesome you were able to see it! I hope April is a great month for you!!! Blogging goals can be tricky sometimes – real life just gets in the way! I’m not big on setting monthly goals but this year, I’m doing habit changes for each month. Still haven’t figured out April’s. I’m awful at email and scheduling posts ahead of time. Thankfully most people are understanding and forgiving. I LOVE This idea! I can’t write posts ahead of time either! 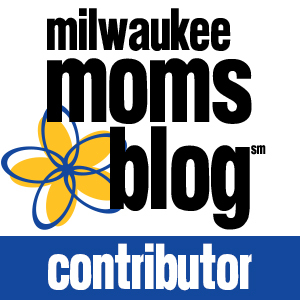 Decluttering is on my list too – good luck! You’ve had a lot going on this month! I haven’t even sat down to write my goals for April, I don’t know if i will blog them or not, i am in sort of a rut. Oh, I want to see Beauty & The Beast! I may treat myself next week. It is hard to get posts written in advance, I was doing good for like 3 weeks last month then fell off the wagon face first. I know you’ll knock your goals for April out and make it look so effortless. Good for you trying to get up to 3 posts per week. I am doing one right now and that is about all I can handle! Isn’t acid reflux the worst?? Thankfully I’m on meds for it now which has helped so much! I also need to update my water intake. I’m trying to add fruit to it so it makes it a little more interesting! You did great in March. My blog goals usually fall a bit short too. I’m typically writing a blog post the night before it needs to be posted or quickly trying to pull something together in the morning. Good luck in April!